Forecast for the holiday weekend was looking fairly good earlier in the week but couldn’t get the Friday off even though it looked even better. Reserved a place on the Knoydart Seabridge Ferry for the first service on the Saturday at 1030hrs (though with the possibility they may put on an earlier service if needed). Also reserved a return trip from Inverie on the Sunday at 1700hrs (with an option for 1400hrs depending on how I got on). Got a phone call on the Friday morning to say that there would be an 0815hrs service so jumped at the chance especially as the Saturday afternoon forecast had gone downhill a bit. A bit too much to do that evening meant only a few hours sleep before an early start for Mallaig. Arriving at Mallaig, the long stay car park on the left was full – probably due to the early CalMac sailing. Drove round to east bay and parked in one of the long stay spaces (not the first batch which are shorter stay). Wandered round to the harbour and spoke with a couple who were the other passengers on the same trip. Passed Rubha Raonuill with the statue of the Madonna which was erected by the Catholic community marking the entrance to Loch Nevis. Walked past the plaque erected in March 2009 which commemorates the tenth anniversary of the Knoydart buyout. Then past the memorial to the Seven Men of Knoydart who attempted unsuccessfully to claim land and crofts from Lord Brocket on Knoydart not long after the second world war. Walked on and caught up with the three walkers who all worked for the same business in Edinburgh – for one of them this was his first hill walk – they were staying in the bunkhouse and were planning to walk Meall Buidhe. We continued together up Gleann Meadail and met another two walkers who were aiming for a corbett. Past the monument to Lord Brocket who bought the Knoydart estate in the 1930’s and was a personal guest at Hitler’s 50th birthday in 1939. The three had originally considered walking up the glen to the bealach then up to Meall Buidhe but changed their minds and opted to approach the more direct route which I was planning. The bracken was only just starting to grow so the going was quite good – could imagine it being a lot harder in high summer. The three stopped a few times and were soon quite far behind. Unfortunately I couldn’t wait for them as I had a bit farther to go so pressed on. Met three other walkers at the summit – think they said that they had set off about 0700hrs from the bunkhouse. One was going back as he wasn’t feeling too fit and the other two set off just as I arrived. A fair few ups and downs on the way and a bit rough at times – guess that’s why they’re called the rough bounds. Clear views of where I was headed through. Met two walkers at the summit who were up for some photography. Also met a lady walker who had camped high on Ladhar Bheinn the previous night ( with better weather than I was about to experience). After some food, headed off NW down towards Mam Barrisdale. Was starting to run out of water at this point but unlikely to be any until much further down. Got to Mam Barrisdale with the weather starting to turn. Had originally thought about camping up at the 849m point, leaving the rucksack, walking up to Ladhar Bheinn then returning to Inverie via Sgurr Coire Choinnichean. However, this would require good weather and a lot more walking that evening which was not looking feasible. Had to find some water and the first burn marked on the map turned out to be dry. Kept going NW and the next burn had a plenty water. Followed it uphill until it started to disappear when I stopped to replenish my supplies. After an extended stop I set off again laden down with about 4kg of water to cover dinner, breakfast and the next day’s walk. Was past the 640m point to the right high up on Coire a’ Phuill when the rain started. Just at that point a large group appeared on the way down – they were finishing off the circuit of Ladhar Bheinn and were staying at the White House. I could see the next bit was steep before reaching the traverse path and, with the rain starting, decided to stop for the night even though it wasn’t much after 1730hrs. Rain and wind most of the night. Woke up early, looked out to see clag and rain and went back to sleep. Eventually had breakfast and got everything packed up inside the tent. A lull in the rain and I quickly got out and packed up the tent. No more photos until reaching the top. The rain returned as I set off a little after 0700hrs. The first part was a bit scrambly require hands and the occasional knee before getting to the traverse path up to the 849m point. A few more scrambly up and down bits on the way to the top but couldn’t see anything in the clag and rain. Think the camping pack and the rain made these bits harder than usual. Didn’t hang around long as the clag and rain didn’t look like clearing. On the way down, met two walkers on their way up – think they said they’d been on Rum the previous week and that it had been very warm. Then the long walk back to Inverie in the rain. Arrived before 1300hrs – phoned from the shop to check I could get the earlier ferry back and had a chat with the lady in the shop. Met up with my fellow passengers at the harbour for the return trip. Turned out that the 1700hrs sailing was fully booked with some not being able to get a space so I’d be freeing up one space. Then the drive back to Glasgow in plenty time for dinner. First trip to Knoydart, really do want to return. Cnoideart ..a cracking area ,good coast walks also. Nice one this is a stunning area, just a pity about that clag as the views are superb from up there. Shame about the clag RH,another good round though.Must get to these this year,although being a purist i won't be taking the boat! pigeon wrote: .........although being a purist i won't be taking the boat! Nae more boats for me,will you let me of with the ferry to Mull? Nearly there - grand work. Well done, those hills are hard work, even without a full pack! Shame you didn’t get the views on the second day, but at least you got them on the first! I hope you get a few good days soon for Torridon! Going to attempt this next Monday & Tuesday! Sadly the old forge is shut at the moment - was looking forward to that at the end of a big walk. 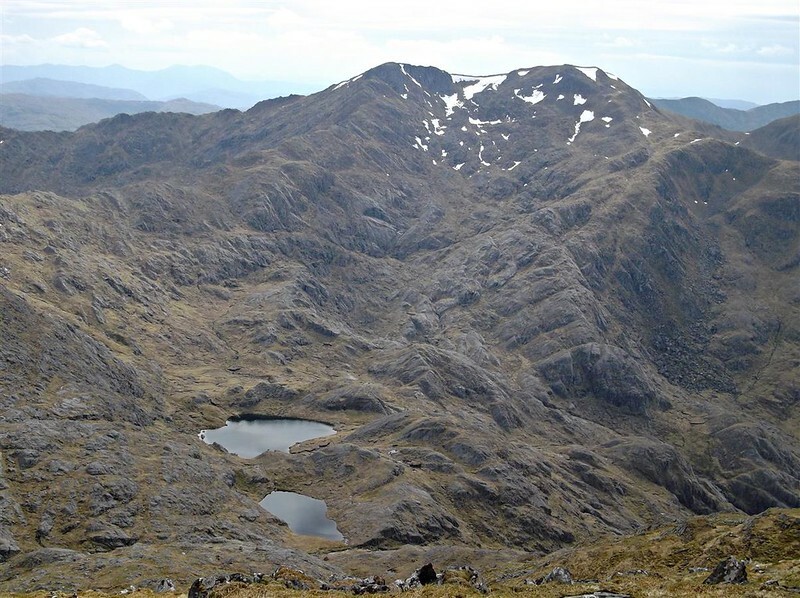 Very useful report, thank you - my partner and I did a round of Meall Buidhe, Luinne Bheinn and Ladhar Bheinn this weekend and your report was very helpful when we were planning the route.